Wonderful with roast chicken, or as a stuffing for vegetables. Melt the butter in a large frying pan over a medium heat. Add the onion, cook gently for 3-5 minutes. Add the garlic and cook for 3 minutes. 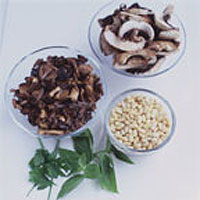 Add the fresh mushrooms, cook for 5 minutes. Strain the ceps, squeeze dry, chop and add to the pan. Cook for 2 minutes. Transfer to a bowl. Cool. Add the Parmesan, pine nuts, herbs and 85g breadcrumbs. Season well. Add the eggs. Put in a baking dish, top with the remaining breadcrumbs and drizzle with the oil. Bake for 20 minutes. Serve in slices.